The San Francisco Crooked Street Segway Tour is the newest most challenging route yet! Ideal for those who have ridden a Segway before, wish to see a little more and test the machine a little further. What better testing grounds than the hills of San Francisco! This small-group tour is limited to 8 people, ensuring a more personal experience. Previous Segway experience is required. All riders must have taken at least a 2-hour guided Segway tour on the newer i2 Segway within the last 2 years. Test rides and tours on older Segway models do not qualify. There are no exceptions to this requirement. The hilliest and most challenging route! 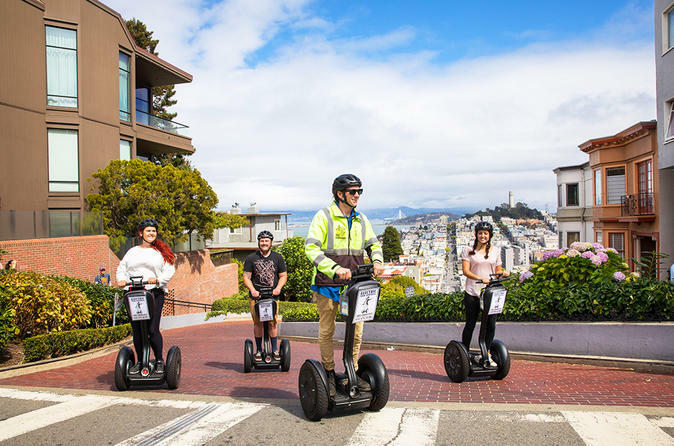 This segway tour includes scooting up Russian Hill and down the famous Lombard Street, seeing the sights in North Beach, Little Italy and a glide along the waterfront. If you wish to join this advanced tour, you must have taken a segway tour (2 hours or more) in the last 12 months. This is not a beginners tour nor appropriate for guests with mobility issues. Enjoy Eco-friendly touring! On an eco-friendly Segway tour you'll see more sights than you could cover on foot, and have lots of fun. There's an added benefit for the environment if you take a Segway, there are fewer tour buses on the streets of the city each day you are helping keep San Francisco "The Greenest City in the United States". Stop and see St. Peter and Paul's Church and Washington Square Park the center of "Little Italy"
Tour stops several time for photo opportunities. Please Note: Participants must have a minimum of 2 hours of past Segway riding experience in the last two years. You MUST note when and where you have participated in a Segway tour in the "Special Requirements" field at time of booking.